Emerald, a beautiful member of the beryl family. It gets its green colour from the presence of chromium and vanadium. Flawless stones are rare and expensive. Material that is cracked and heavily included is often used, these stones can be "oiled" to improve their appearance. The best emeralds come from Columbia. Other sources are Australia, Brazil, Austria, India, South Africa, the USA, Norway, Pakistan, Zimbabwe and Egypt. Emerald, the Unconditional Love Stone is a deep green beryl stone of great power. It strengthens the heart, liver, kidneys, immune system, nervous system.It is a tonic for body, mind and spirit. Emerald helps with the alignment of subtle bodies. It helps one gain deeper spiritual insight by introducing the higher Self to the divinity within, it enhances dreams. Emerald attracts Prosperity, Love, Kindness, Tranquillity, Balance, Healing, Patience.Strong emotional balancer. 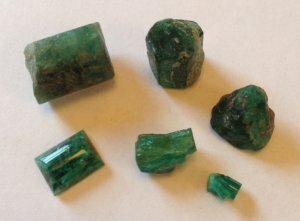 Emerald has been very popular throughout the Ages. It is the Traditional Birthstone of Cancer. Of the 12 tribes of Israel, the tribe of Levi is associated with the star sign Cancer and has Emerald as their stone. Traditional Astrology also ascribes Emerald to Cancer. But Gemini gets Emerald as both its Traditional and Modern Birthstone too. Emerald is marked as the Mystical Birthstone of Aquarius and is also associated with Pisces. The famous mineralogist George Frederick Kunz in his 20th century book 'The Curious Lore of Precious Stones' associated Emerald with both the planet Mercury and the planet Venus. The 17th century Christian astrologer William Lilly associated Emerald with the planet Jupiter. Emerald activates Manipura - the Solar Plexus Chakra ( 3 ) and Anahata, the Heart Chakra ( 4 ).